Today is National Doctor's Day! A day that reminds us to recognize the dedication and contributions of physicians to their patients and communities. Many nations around the globe celebrate their doctors, though the date varies. Brazil celebrates on October 18th in honor of the birth of Saint Luke. Iran, Cuba, India, Vietnam, and Nepal also established their own holiday to show appreciation for the unwavering care of their physicians. The Annual Tarascon SITE-WIDE SALE is Here! You've been good all year, so this holiday season treat yourself and the medical superheroes in your life to our acclaimed series of must-have portable drug guides. Don't Just Take Our Word for It. We can tell you how valuable the Tarascon Pharmacopoeia app is all day long, but we think you should hear it from your peers. "INDISPENSIBLE. By far and away the most useful, best designed program of its type. Curated by pharmacists and clinicians. Unbiased data. Does not sell your look-up data to pharma, unlike the "free" e-poc-ra-tes. Worth every penny." Same Price. Same Content. Larger Print. 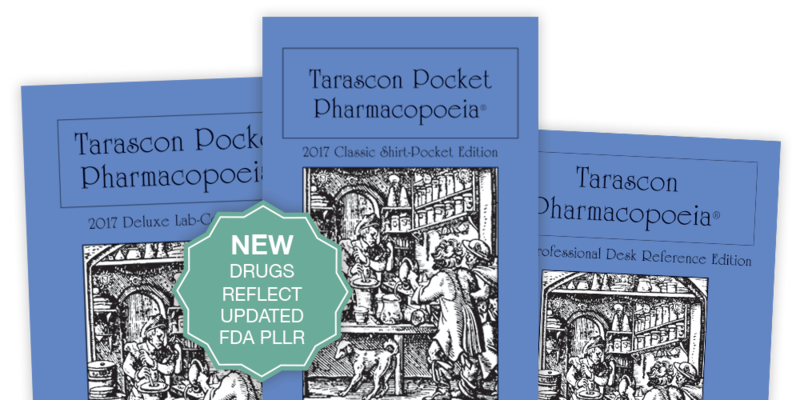 Featuring the same content as the Tarascon Pocket Pharmacopoeia 2017 Classic Shirt-Pocket Edition but with larger, easier-to-read print, the Large Print Edition continues its tradition as the leading portable drug reference packed with vital drug information to help clinicians make better decisions at point of care. The 2017 Tarascon Catalog is Here! You know how invaluable the Tarascon Pharmacopoeia is, but do you know the Tarascon story? The Tarascon Series is named after the Tarascon castle in France where the original author was visiting when he decided to turn his “cheat sheet” of drug information into a published book. Every year we include a trivia question in the Classic and Deluxe books. The first 25 people who find it and respond with the correct answer get a prize. The 2017 Tarascon Pharmacopoeias Are Here! 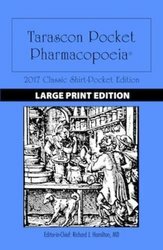 Ask anyone at Tarascon, our favorite time of year is when we get to announce the new editions of the Tarascon Pharmacopoeias. The 2017 editions of the most popular and trusted source of portable drug information are here! The Tarascon Pharmacopoeia features new drugs that reflect the updated FDA Pregnancy and Lactation Labeling Rule (PLLR) and of course has been updated with the latest FDA Guidelines and new drug information. EvidenceCare, a Nashville-based decision support tool for healthcare providers, announces the integration of drug information from Tarascon Pharmacopoeia, the most popular and trusted source of portable drug information since 1987. The integration provides EvidenceCare the opportunity to deliver content that has been relied upon by Providers worldwide for nearly three decades. EvidenceCare presents the information in a format that is easy-to-access and is personalized to each unique patient. Review: Tarascon Pharmacopoeia 2015 Professional Desk Reference Edition is "very useful for practicing clinicians"
The Tarascon Pharmacopoeia 2015 Professional Desk Reference Edition has already been receiving rave reviews from fans, but now Doody's Review Service is also singing its praises. Reviewer Jennifer L. Colon, PharmD, MS, MBA noted that this reference "is a high quality, yet easy to use, reference that is very useful for practicing clinicians. Now through December 22nd receive 20% off plus FREE shipping on all print products at Tarascon.com.